Kids Den provides play opportunities for the children from schools in the surrounding area. Our aim is to provide Opportunities for the individual child to achieve his or her potential in a fun, friendly, safe and caring play environment. A place where children will want to go before and after school! We are of course Ofsted registered and inspected. Some children attend on a regular basis as their parents are working, and some just come for special activities such as;, discos, cookery or messy play. We offer permanent and adhoc bookings for those needing flexibility. The Club is based at Kids Den, Clocktower, Redvers Buller Road, Aldershot. Feel free to pop in and have a chat with us . If your child is between the ages of 4 years and 12 years of age then they can attend Kids Den Club. During session times we offer a healthy snack, and water and milk is available. The children make decisions on the activities that they would like to do, the adults lead some activities and ensure that the environment is a safe and welcoming place for the kids to play and have fun in. Free play toys are available for those children that do not want to join in. How Do I Book My Child In? Call the Team Leader on 07833 251552 or pick up a booking form from the school office or from the Casa website. You need to be registered with us before we can accept a booking. You can even book on the day. We accept childcare vouchers and working parents may be eligible to claim working family tax credit. 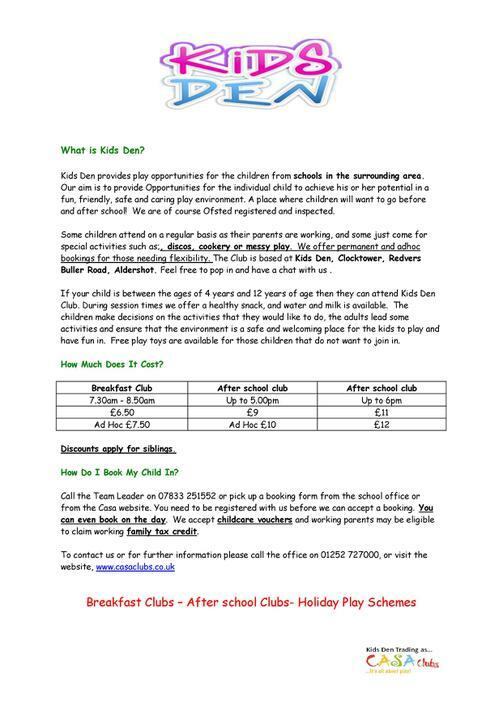 Kids Den Website Information for booking Breakfast Club and After School Childcare.